That’s the exceedingly bright, neon-like shade that has come to define the company now known as Paragus Strategic IT since it changed its name from Valley ComputerWorks and embarked on an aggressive branding initiative several years ago. And there’s a lot of it at this technology-solutions company’s new headquarters facility on Route 9 in Hadley, which was unveiled at an elaborate launch last week. There’s also a somewhat softer, muted version seen on some interior walls, carpeting, and other places, as well as a host of other exotic colors, including shades of orange, blue, and purple. But the colors only begin to explain why this 8,200-square-foot facility is now among the most unique — and destined to be emulated — workspaces in the region. There are also the small meeting rooms (there are no private offices at Paragus, so employees need spaces in which to gather and talk privately), including one with an image of founder Delcie Bean called Beantown, another called the Bat Cave (yes, there are images of bats on the wall), and still another called the Bullpen, with a Fenway Park backdrop. Then there’s the game room, now outfitted with a ping-pong table, with a pinball machine on the way; a huge kitchen (called the Hatch) complete with a pub with several beers and wines on tap; an outdoor patio equipped with grills; a locker room complete with a shower for those who want to work out during the day; a large classroom for training dubbed Paragus University, and inspirational quotes from noted entrepreneurs and business consultants — such as Peter Drucker’s “the way to predict the future is to invent it” — hanging on the walls. And don’t forget the weathervane on the roof. It’s a large representation of the company’s logo — an infant lifting a barbell, complete with a stainless-steel diaper — and it’s equipped with a large spotlight so it can be seen day or night. 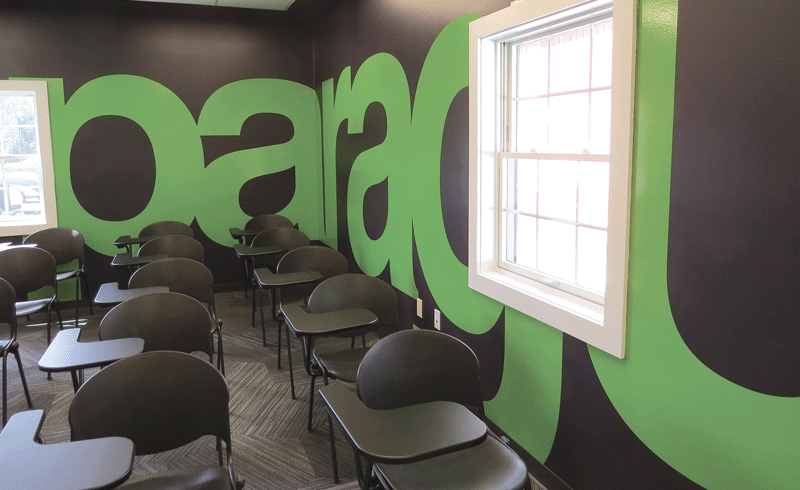 Paragus University, like all areas in the new headquarters facility, reflects the company’s vibe — and prominently features the color green. All these components and many more reflect what Bean, one of the region’s most celebrated entrepreneurs, called the “Paragus vibe,” which he described as a mix of fun and professionalism. 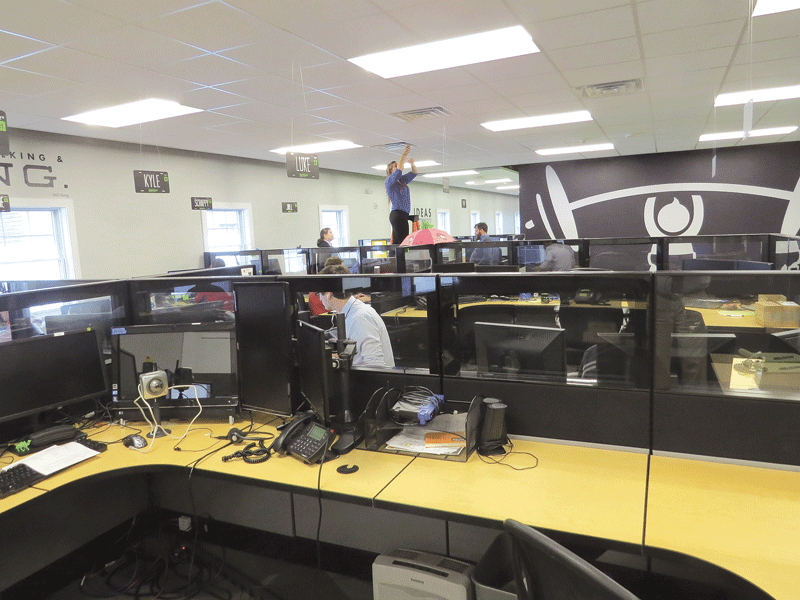 And he put very strong emphasis on that word ‘we.’ Indeed, this new workspace came about through a team effort, one involving a number of players, including employees at all levels. 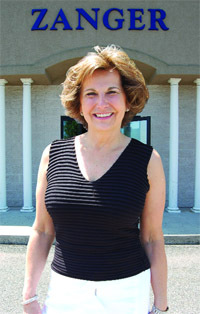 Usually, things don’t go well when they are handled by committee, especially one with a number of subcommittees, but in this case, they did, said Bean, who told BusinessWest that several small groups of employees were given assignments ranging from the furniture to the pub to the décor in the conference room, or the war room, as it’s called. An interior designer was also hired, and there were many design contributions (including the weathervane) from the marketing firm Darby O’Brien Advertising, which orchestrated the Paragus branding efforts. Roughly two years after they started, and with ideas inspired by companies ranging from Microsoft to the online shoe retailer Zappos, the new Paragus workspace is ready for prime time, and Bean believes it will succeed in its primary missions — to create a workplace that’s comfortable, inspires innovation, and helps the company with the critical assignment of attracting and retaining talent. Gainer O’Brien, creative director at Darby O’Brien Advertising, also used that word ‘vibe,’ mixing it in with ‘culture,’ ‘brand,’ and ‘mentality’ to describe what the new facility was designed to capture — and amplify. For this issue and its focus on commercial real estate, BusinessWest toured the new Paragus space and talked with some of those who shaped it to gain some perspective on the many ways it reflects what this company has become — and where it might go. On a shelf in the front lobby of Paragus’s new facility sits the many plaques the company has earned by making Inc. magazine’s recent lists of the country’s fastest-growing companies. They effectively, and succinctly explain why this expansion was necessary, but Bean offered some details. 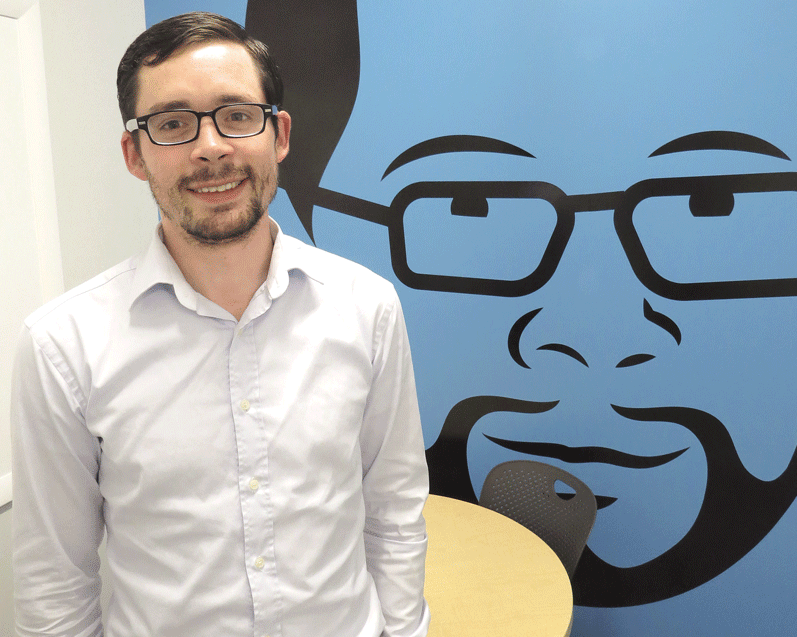 He told BusinessWest that the company, which he started as a one-person operation when he was 13, eventually settled in an old Colonial on Route 9 in Hadley. As it grew, it expanded into the Colonial next door, he explained, adding that his venture soon outgrew that combined space as well. An employee hangs license plates identifying cubicle occupants by their first names — one of several design features borrowed from Zappos. As the search for a site on which to create a larger facility commenced, the company moved into temporary quarters in Harrison Place in downtown Springfield, making the black-and-green-painted Paragus Mini Coopers common sites on the streets of the City of Homes. Bean said the company considered a number of locations in and around Hadley for its new headquarters, and nearly closed on a site in Northampton before eventually opting for a site behind the county courthouse on Route 9. The existing structure there, which most recently had served as a school, was in poor condition and needed to be razed, he noted. While that search was taking place, Bean and company employees began to visit other workplaces to gain perspective, insight, and ideas. Among the facilities toured were Microsoft’s NERD (New England Research and Development) Center in Cambridge; the Harvard Innovation Lab, or iLab, as it’s called; the Cambridge Innovation Center; and Zappos’ headquarters in what was once City Hall in Las Vegas. From those visits, and especially the Zappos tour, participants absorbed ideas such as the inspirational quotes on the walls and the use of license plates to identify the occupants of cubicles (the registration sticker in the corner indicates what year he or she started with the company), said Bean. But the broad goal was to create something unique, he added, something that “said Paragus” and reflected the company’s culture. From the beginning, there has been plenty of input from employees, because that is a big part of the company’s culture, said its founder. What all those subcommittees and others involved in this undertaking produced is space that, as Bean suggested, effectively mixes fun with professionalism, form with function. Indeed, just around the corner from the game room is a wall that will soon host a huge screen that will enable the staff to monitor the servers at its dozens of clients and instantly spot trouble. The weathervane with the company’s logo was perhaps the only opportunity for Paragus to fully express itself with the building’s exterior. Matt Dubard, art director for Darby O’Brien Advertising, agreed, and said the facility’s design captures and perpetuates a spirit of innovation and entrepreneurship. O’Brien used the word “youthful” to describe the company, its culture, and what needed to be conveyed in the various elements of the new facility. As for the weathervane, well, it was perhaps the best, and only, chance for the company to express itself through the property’s exterior, said O’Brien, noting that it lies in an historic-overlay district that is heavily regulated when it comes to design. But there are no regulations that anyone knows about regarding weathervanes. The same might be said of the new facility as a whole, and Bean acknowledged that the company will likely be fielding some requests for visits to see the space. And while he expects to be leading some tours himself, he will let others at the company share that responsibility — and privilege. One framed picture not up on the wall when BusinessWest visited Paragus (Bean’s not sure what he’ll do with it) depicts the downtown Springfield skyline maybe seven to 10 years from now, when the company is expected to have outgrown the new space on Route 9. It shows a gleaming steel skyscraper, perhaps 40 stories high, with the Paragus name on the side — in huge ‘outrageous green’ lettering, of course. This imagery was a gift from the O’Brien agency to indicate one possible future for Paragus and other small businesses that may be started by some of its employees in the years to come, said Bean, who’s not sure whether it represents anything approaching what might be reality. What he does know is that the current home represents a big step forward for his venture — and a true reflection of its vibe.